Oh, the ankle bootie. I will admit to being a late adopter of this trend, but I blame the 80s and their silly tiny slouchy boots that made no sense to me. The obvious approach to ankle booties is to wear these under jeans or trousers, the awesome approach is to pair them with skirts and dresses. 3. Your best friend is a pair of opaque, black tights with a miniskirt and black ankle boots. Again, it’s all about elongating the lines. 4. Watch the top of the boot. If it cuts straight across, it may make you look stumpier than you are. I’ve seen it work, even in contrast with the tights or pants (see below), but it can be very hard to pull off that boot shape. It may be safer to find one that is angled in front or more “shoe-like”. 5. Ankle booties are a great way to toughen up a flirty dress for a more downtown feeling. It’s not the safe route, but you’re a risk taker. Besides, there is always a pair of pumps waiting for you – so try it a few times for a new, interesting way to remix a dress. Now is a great time to snap up deals in boots – and, trust me, these will be around next season. It’s a sound wardrobe investment. 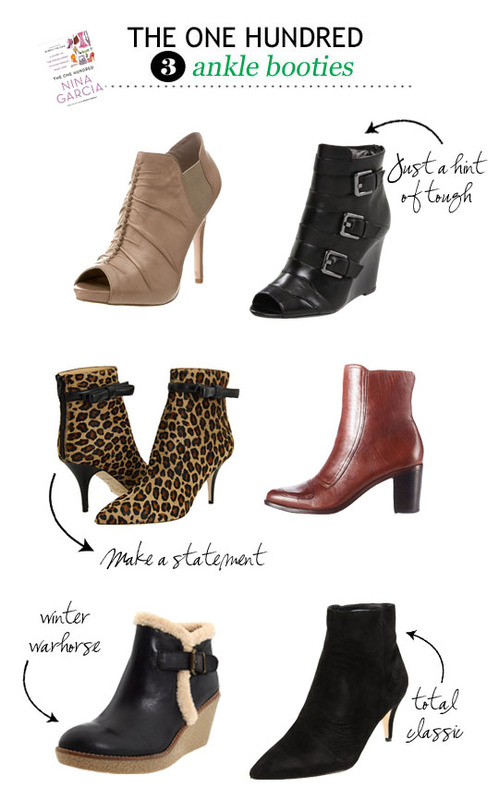 Want to learn more about ankle booties? Of course you do. Pick up a copy of Nina Garcia’s “The One Hundred” for yourself! We’re working our way through all 100 items to assemble the perfectly stylish, workable collection.